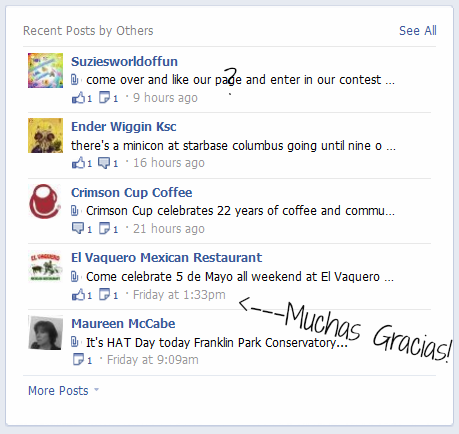 Muchas Gracias to El Vaquero Mexican Restaurants for sharing their 2013 celebration on ’365 Things to do in Columbus Ohio’ on Facebook. 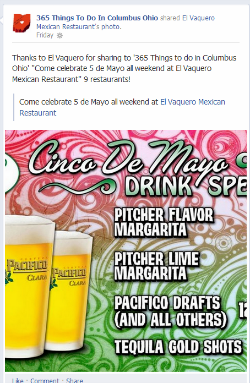 Thanks to El Vaquero for adding “Come celebrate 5 de Mayo all weekend at El Vaquero Mexican Restaurant” *on ’365 Things to do in Columbus Ohio‘ on Facebook. 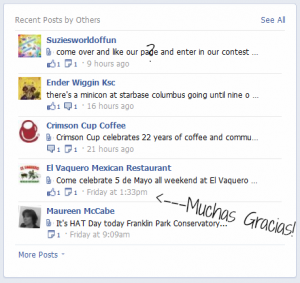 There is a link to the Facebook page (365 TTDICO) in the sidebar on ColumbusBestBlog.com. 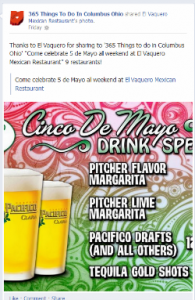 There is more about the history of Cinco de Mayo on the El Vaquero Mexican Restaurant Facebook page. Cinco de Mayo is not Mexico’s 4th of July. Cinco de Mayo is more than a day to eat Mexican Food (authentic and otherwise) and drink tequila and beer. This year restaurants had three days to celebrate Cinco de Mayo with it falling on Sunday. Previous post: How Cool for Columbus Farmer’s Markets?